Since I was a medical student, I sought opportunities to travel to underdeveloped countries in hopes of making a difference in the health care there. I didn't have much to offer in terms of skills or funds to even invest in such a trip. Fate had its way with me and landed me in Moses Cone Family Medicine Residency program with UNC Chapel Hill faculty member, Wayne Hale, M.D. It was a good fate. For several years, Dr. Hale has been traveling to Honduras for medical brigades with Hombro a Hombro, a group dedicated to improving the health and education of those in rural areas of the country. 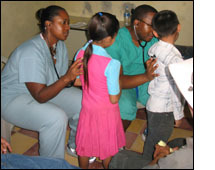 In February 2008, I had the fortune of traveling to Santa Lucia, Honduras with Dr. Hale and a group of UNC Chapel Hill's students, faculty, pharmacists and one of my fellow residents. Now I was equipped with the skills and through donations and a scholarship, was able to meet a goal that was several years in the making. I was truly amazed at how organized the clinic was and how smoothly it ran. Once at the clinic we were separated into three groups. One group would stay on site and staff the clinic, the rest of us would split into two groups that would set up clinic at some of the outlying communities for a few days. Both of the sites I worked at were only buildings no bigger than about 800 square feet with not much in them besides a couple of rooms and maybe a table or two and water that was on intermittently. We saw 150-200 patients in a full day. Interpreters from a bilingual high school helped those of us that took French in college. Children were weighed and measured, hematocrits checked, vision tested and given vitamin A, albendazole and multivitamins to last a month. Their final stop was for dental varnishing where they were also able to get a toothbrush to take home. Home visits were done for those children that were below the growth curve to see what kind of nutrition they were receiving and supplements were to be brought to the home later. I did cervical cancer screening on young women using headlamps, the same one I used at night for reading my book, writing in my journal and making my way to the bathroom at night. The general medical clinic saw everything from muscle strain, melasma, and URI's to allergies, dyspepsia, depression and arthritis. Some home visits were also done for those people who were homebound and unable to make it to the clinic. At the end of the three or so days at each site, we packed up all of our supplies and headed back to Santa Lucia. The trip was eye opening and humbling. It was hard to leave knowing that while I helped some people temporarily, did I really help anyone long term? I am a Family Physician because I enjoy continuity of care. But I guess I also enjoy helping those that need it. Would I do it again? Yes! Undoubtedly! Gracias a Doctor Hale y Hombro a Hombro para la oportunidad de ayudar las personas de Honduras.